Murphy's Law Breaker: Bill Maher and Kathy Griffin: Jokes that hurt and jokes that kill. Danny Murphy's blog. It's mostly about Positive Thinking and How to Tell Jokes. Bill Maher and Kathy Griffin: Jokes that hurt and jokes that kill. More laughter. Once in a while when you do standup, you can say anything and people will laugh. I even blew a few punchlines that night and people still laughed. On the other hand, when you tell lots of jokes, some of them are going to go wrong. Sometimes when you say something off-the-cuff, you realize immediately that you shouldn’t have said it. Then you say, “I’m sorry. That was just a joke.” Sometimes an incident like that really is just a joke. At other times, the joke teller in question is saying it was just a joke only because someone got ticked off. A big part of Bill Maher’s schtick has been making snarky remarks in response to one of his guests. He used the N word recently. In the moment, that seemed funny to him. Although Maher has a history of being edgy, he doesn’t have a history of using the N word often. The next day he posted an apology. Nevertheless, there are people who view him as a habitual envelope pusher and they want him to suffer serious consequences. Kathy Griffin’s severed head incident was more than an offhand remark. Sometimes when a photographer is wrapping up a shoot, he or she says, “As long as we’re all set up, let’s try something zany.” From what Griffin said about the shoot, that may have been how the severed head photo came about. Still, the Trump head photo required a prop and that takes at least a little premeditation. At the outset of the press conference, she mentioned that she was nervous and that she probably would resort to jokes as a result of that. Still, going into standup mode in response to serious questions seemed strange. That’s her persona and it’s what she does, but it still seemed odd. It doesn’t seem like the press conference helped her to begin salvaging her career. Griffin has been ridiculing Donald Trump since before he was elected. Contrary to what some people say, ridicule isn’t harmless. More often than not, it is intentionally destructive. Jokes can be very effective for pointing out how ridiculous and stupid someone is. People use ridicule to make fun of other people in an effort to break their spirit, one verbal swipe at a time. People who enjoy insulting others say, “It was just a joke,” with some frequency. The more a person says it, the less likely it is to be true. 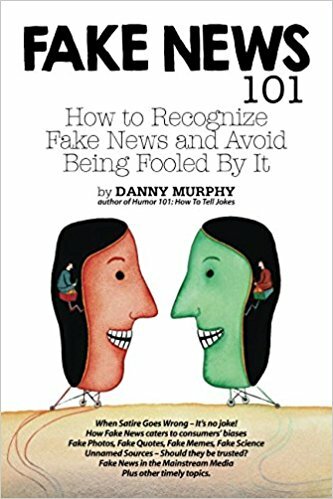 Check out Danny’s books at Amazon.com. When love goes wrong. Happy Valentine’s Day! Jokes from the Road Less Traveled. Are you a wit supremacist? Danny Murphy is a writer and humorist from Jacksonville, FL. He has had hundreds of articles, letters, book reviews, and more published in dozens of newspapers and magazines. He has also written a good deal of corporate literature including annual reports, newsletters, and marketing materials. He has ghost-written dozens of articles and a book for clients. As a write-in candidate for Congress (FL CD4) in 2016, Danny got over 400 votes. Although he didn't win the race, his campaign to Make America Laugh Again will not soon be forgotten. Danny is available for contract writing projects. Whether you need some help with a book or with weekly blogs, marketing materials, or other content, he can help. He’s especially good at humor. If you would like to find out more, send an email to danny@dannymurphyauthor.com. If you would like to use any of the content on this website, please contact Danny about that. Copyright 2016 by Danny Murphy. Simple theme. Theme images by gaffera. Powered by Blogger.